Are you a thrill seeker? Do you like adventure and games? There are many attractions in Old Montreal to cater to the adrenaline seeker and the adventurer in you. Whether you are planning a visit to Old Montreal or if you live here but have never bothered to visit this historical neighborhood of the city, we’ve got you covered. In our research to develop a Tourist Scavenger Hunt in Old Montreal, we came across much information, some of which can only be gleaned when doing the actual scavenger hunt. However, we also wanted to share some of that information with you for your visit planning. Here are 8 attractions in Old Montreal you need to see and enjoye. As you walk to the very tip of Clock Tower Pier, you will find a small sandy beach where you can sit, take in the sun and relax. It wraps around the pier on a lower level which cuts out most city noises. From various spots, you can enjoy a great view of Saint-Helen’s Island on which you can see La Ronde, Montreal’s Six Flags theme park as well as the Stewart Museum which is the long wooden structure before the bridge and the Tour de Lévis – a tower at the highest point of the island. You can also admire the Jacques Cartier bridge and gaze at the boats of all sizes traveling under it. There is a $2 entry fee per person. Montreal’s Bateau-Mouche reminds you of Paris’ Seine river cruises on low glassed-in longboats. Take a 60 or 90-minute cruise to either explore Old Montreal and the city proper from the Saint-Lawrence river or to dine on a riverboat. Cruises start at 12:30 daily until 7 pm from June to mid-October. Pricing varies from $12.50 for children to $25 for adults. Cruises leave from Jacques Cartier Pier. Are you looking for a trill? Do you enjoy getting soaked? Look no further, Saute-Mouton is the attraction you’ve been looking for. Caterpillar engine speedboats take you from the small marina next to Montreal’s Clock Tower pier and SOS Labyrinthe on the Saint-Lawrence to the Lachine Rapids. Then, it proceeds to toss you around in the rapids as if you were a rag doll, a soaking wet rag doll. Tours run from June to early October from 10 am to 6 pm. You should consider reserving in advance as tours are usually full. A ride will cost between $49 for children and $69 for adults. This labyrinth constantly changes its 2 km floor plan. You will find it located in the far east of Old Montreal, in the middle of Clock Tower Pier, in a former longshoremen’s warehouse. It is open weekends from 10 am to 8 pm from May until October with some weekdays and extended hours at different days. Check their website for specific dates. Rates start at $12.50 for children to $16.50 for adults but they also have family and group rates. the Jacques Cartier and Victoria bridges. All in all, riding will cost you between $20-25 and you should reserve well in advance as places are limited. You will find Tyrolienne Mtl Zipline located in the Old Port of Montreal next to SOS Labyrinthe. Shortly, you will be ziplining for 1200 feet to the Bonsecours Basin. This attraction should not take more than 15 minutes. It is open from 11 am to 9 pm. In any event, fees range from $17 for children to $20 for adults and there are weight and age restrictions. This aerial amusement park sits next to Tyrolienne Mtl Zipline, across from the Bonsecours Basin. Indeed, it is an immersive adventure park where you climb aboard life-size replicas of a royal and a pirate ship, each over 100 feet long. There is a $45 fee to access the park for up to 4 hours. Tha is to say, it is open daily from 9/10am to 8/11pm from mid-June to early September and weekends throughout September and October. Paddleboats are available for rent from April through to October, from 10 am to 8 pm. Accordingly, renting a paddleboat is a great way to relax in the Bonsecours Basin in the heart of the Old Port of Montreal. Of course, you will enjoy great views of the Grande Roue de Montréal, people ziplining and Terrasses Bonsecours. Pricing starts at $22 and combos are available to include quadricycles. We invite you to try our Old Montreal Tourist Scavenger Hunt. It is a 2 and a half hour guided walking tour around Old Montreal you do on your mobile phone (how it works). It only costs $30 for your group. You will enjoy seeing these attractions and much more while completing challenges and learning Montreal’s history. When you travel, do you make a point to try some of the city’s best, or most local, restaurants? Are you looking for the best places to eat in Old Montreal? Old Montreal is chock full of very old, and some new, restaurants, many of which are among the best the city has to offer. We also wanted to share some of that information with you for your visit planning. Here are 7 great places to eat in Old Montreal. In fact, some of the places presented here actually enclose several restaurants. Located in the extreme west of Old Montreal, where the Lachine Canal ends in the Old Port of Montreal, the Maison des Éclusiers now houses a food court showcasing the best products Quebec has to offer. In addition, a second story deck offers great views of the Lachine Canal and of the Old Port of Montreal. Maison des Éclusiers translates to Lock Keeper’s House. The lock keeper resided here while managing Lachine Canal’s two final locks. Food trucks are permanently located outside the Montreal Science Center on King Edward’s pier. Perfect for a quick bite, Montreal’s food trucks are all high-end cuisine, offering a variety of quality fares for foodies. As a matter of fact, you will be hard-pressed to find hot dogs and hamburgers or other common foods offered by street vendors in other cities. You will find Le Bremner located at 361 Saint-Paul E, across from the Marché Bonsecours. Indeed, Le Bremner is an upscale seafood restaurant from TV food personality, Chuck Hughes. You will find La Champagnerie practically adjacent to Le Bremner, also across from the Marché Bonsecours, at 343 Saint-Paul E. La Champagnerie boasts the biggest Champaign list you have likely ever seen! You will find Auberge Le Saint-Gabriel located in the middle of Rue Saint-Gabriel, at the intersection of Rue Sainte-Thérèse. This is the oldest inn, still in operation, in North America. Montreal issued its very first alcohol license to this establishment. In any event, it’s restaurant offers creative grill, regional and market fares. With this in mind, we invite you to try our Old Montreal Tourist Scavenger Hunt. This two and a half hour guided walking tour will take you around Old Montreal. As a result, we expect you will enjoy seeing these restaurants and much more while completing challenges and learning Montreal’s history through your mobile phone. is done on your mobile phone (how it works). It only costs $30 for your group. When you travel, do you seek historical sites to visit? Being the very birthplace of the city, there are many varied historical sites in Old Montreal to amaze you. Whether you are planning a visit to Old Montreal or if you live here but haven’t gotten around to visit this historical neighborhood, we’ve got you covered. In our research to develop a Tourist Scavenger Hunt in Old Montreal, we came across much information, some of which can only be gleaned when doing the actual scavenger hunt. However, we also wanted to share some of that information with you for your visit planning. Here are 6 historical sites in Old Montreal. The British government built this Customs House in 1836 on what is now Place Royal. In fact, its crest is a stone sculpture of Albion, representing Great-Brittan. Previously, Samuel de Champlain set up the first fur-trading post on the island of Montreal right here in 1605. On April 17-18, 1886, huge masses thawing spring ice floating down the St. Lawrence river jammed in the narrow shallow waters at the Jacques Cartier Bridge. As the water levels went up, they spilled over the Old Port’s protective wall. Consequently, flooding affected many neighborhoods for a few days. You will find a water height marker located on a building at the intersection of De La Commune and Marguerite d’Youville. The John Young Monument is immediately in front of an entryway and you will find the water marker on the right. 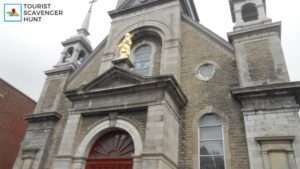 You will find Notre-Dame-de-Bon-Secours Chapel (Our Lady of Good Help) located at 400 Saint-Paul East. The archdiocese built it in 1771 over the ruins of an earlier church built in 1755 which burnt down. It features the remains of Saint Marguerite Bourgeoys, the first teacher of the colony and founder of the Congregation of Notre Dame. 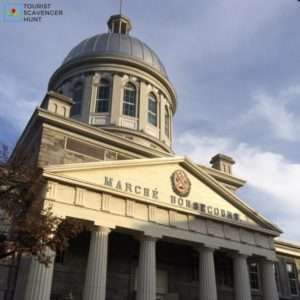 Opened in 1847, the Bonsecours Market accommodated the Canadian Parliament for one session in 1849. 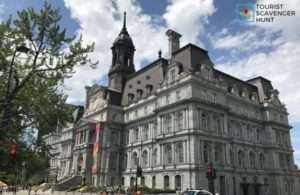 It also housed the City Hall of Montreal between 1852 and 1878. It now houses art galleries, artisan shops, and outdoor cafés. This is also what you will find all along Saint-Paul including some of Montreal’s best restaurants. The Notre-Dame Basilica of Montreal with its 2 bell towers, in Gothic Revival style stands at Place d’Armes, located on Notre-Dame and Saint-Sulpice Streets. Its stained-glass windows do not depict biblical scenes but rather scenes from Montreal’s religious history. Construction completed in 1829. Celine Dion married René Angélil here in 1994. This is also where most Quebec statesmen and celebrities have their funeral service held, as was the case for hockey legend Maurice “The Rocket” Richard in 2000. You will find the Centre d’Histoire de Montréal (Montreal’s History Museum), located in an old Firehouse dating from 1903. It is built in a Flemish style. It is open from 10 am to 5 pm from Wednesday to Sunday. 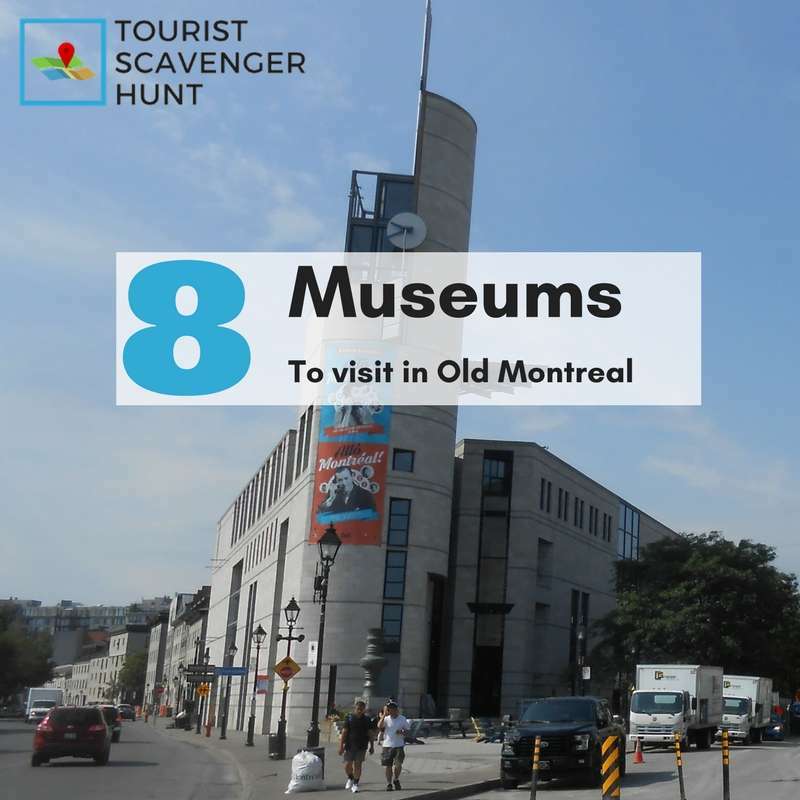 We invite you to try our Old Montreal Tourist Scavenger Hunt. It is a 2 and a half hour guided walking tour around Old Montreal you do on your mobile phone (how it works). It only costs $30 for your group. 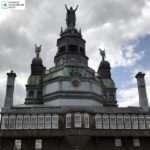 You will enjoy seeing these historical sites and much more while completing challenges and learning Montreal’s history. Do you love art? When you travel do you make it a point to see public monuments, sculptures, and statues? There are many monuments to see in Old Montreal. Whether you are planning a visit to Old Montreal or if you live here but haven’t noticed these monuments to see in Old Montreal, this list is for you. 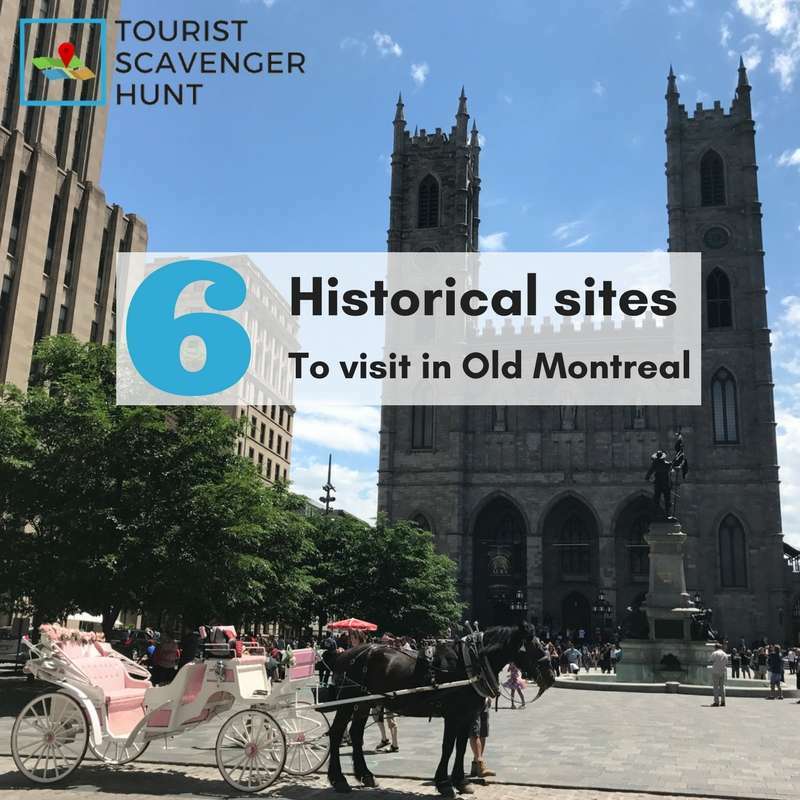 In our research to develop a Tourist Scavenger Hunt in Old Montreal, we came across much information, some of which can only be gleaned when doing the actual scavenger hunt. However, we also wanted to share some of that information with you for your visit planning. Here are 11 monuments to see in Old Montreal. You will find the John Young Monument at the corner of De La Commune and Marguerite d’Youville. This is in the western part of Old Montreal. John Young was the first Chairman of the Port Commission responsible for enlarging and developing the port. As a result, this statue of John Young faces the Old Port. The Silophone is a stone resonance structure. When in function, you stand within the 4 columns facing Silo #5 across the water and speak in your normal voice. You should hear your voice echoed back through the side speakers. Workers completed the Clock Tower in 1921. In fact, it is a memorial to Canadian sailors who died in WWI. This monument is accessible to the public and you can climb its 192-step staircase for an impressive 360-degree view of Old Montreal. Moreover, the Clock Tower is free and is open year-round from 11 am to 7 pm. 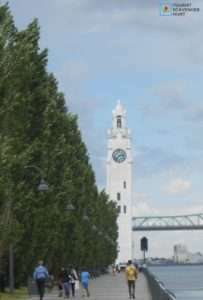 On the back side of Montreal’s Clock Tower is a carving of the first two sailboats to take the Saint-Lawrence River to reach Chicago, in Illinois. To get to Chicago from Montreal, they passed through several channels and many locks. Indeed, they had to navigate across lakes Ontario, Erie, Saint-Clair, Huron and Michigan. Montrealers dedicated this column to the memory of Admiral Horatio Nelson. 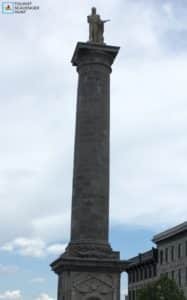 The column was unveiled in 1809, following his death, at the Battle of Trafalgar. You cannot miss it when you are at Place Jacques Cartier. This little park in front of the city’s financial services building is dedicated to Marguerite Bourgeoys. In particular, it presents sculptures of children jumping on stones in the water behind Marguerite Bougeoys. Marguerite Bourgeoys (1620-1700) joined Jeanne Mance (1606-1673) and Paul de Maisonneuve (1612-1676) here in Ville-Marie. Ville-Marie is the old name of Montreal. As a matter of fact, Pope Jean-Paul II canonized Marguerite Bourgeoys on 31 October 1982 and officially raised her to sainthood. 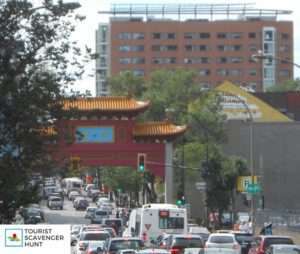 On Saint-Laurent Boulevard at Viger Ave. is Montreal’s Chinese friendship gate signaling your entrance into Chinatown. Montreal’s Chinatown is not very large but very distinctively different from everything around it. Sculptor Louis-Philippe Hébert unveiled the Maisonneuve Monument in 1895 in celebration Montreal’s 250th anniversary. It not only commemorates Maisonneuve, but also Charles Le Moyne, Lambert Closse, Jeanne Mance and the Iroquois. Charles Le Moyne was a military leader. Lambert Closse was the first intermediate governor of Montreal. Jeanne Mance is the founder of the Hôtel-Dieu de Montréal hospital, the first hospital in Montreal. The Iroquois are the principal natives who were here originally. 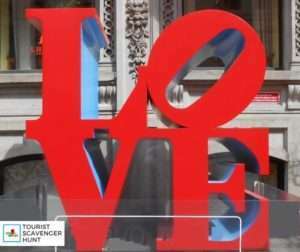 Twin to Philadelphia’s original Love Sign, Montreal’s stand in front of LHotel Montreal. This is a boutique hotel which boasts much modern and pop-art within its colorful lobby. This sculpture created in 1974 can also be found in front of LHotel Montreal. You will find it to the right of Montreal’s Love Sign. Fernando Botero, a figurative artist, and sculptor from Medellin Colombia, sculpted this work of art. You will find the Place de la Grande-Paix de Montréal on Place d’Youville on the western end of Old Montreal. In fact, it is behind the Musée Pointe-à-Caillère. It was erected so as to honor the peace treaty that was signed here in 1801 by Sieu de Callière representing New-France with 39 Native nations. The Obelisk here is a monument to Montreal’s pioneers. The city installed it here in 1893 it’s 250th anniversary. One of its four plaques details the names of Montreal’s first colonists. We invite you to try our Old Montreal Tourist Scavenger Hunt. It is a 2 and a half hour guided walking tour around Old Montreal you do on your mobile phone (how it works). It only costs $30 for your group and you will enjoy seeing these monuments, sculptures and statues and much more while completing challenges and learning Montreal’s history. Are you wondering which museums to visit in Old Montreal? Are you planning a visit to Old Montreal? Or do you live here but have never bothered to visit this historical neighborhood of the city? 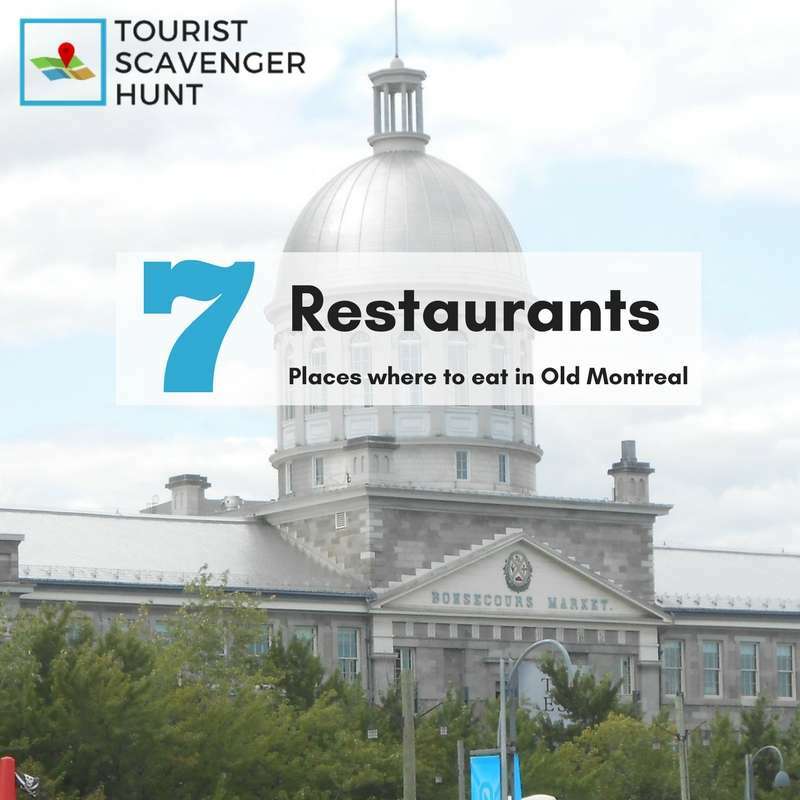 In our research to develop a Tourist Scavenger Hunt in Old Montreal, we’ve come across much information, some of which can only be gleaned when doing the actual scavenger hunt. However, we also wanted to share some of that information with you for your visit planning. Here are 8 museums to visit in Old Montreal. Montreal’s museum of archeology, founded in 1992 as part of Montreal’s 350th anniversary. Indeed, it houses collections of artifacts from the first nations of the Montreal region. Correspondingly, Musée Pointe-à-Callière stands atop archaeological remains of the Little Saint-Pierre River and St.Anne’s Market. Pointe-à-Callière is considered one of the best museums to visit in Old Montreal. In fact, it is one of the best in the entire city! On Place Royal next to Musée Pointe-à-Caillière, you will find this square stone building built in 1836. As a matter of fact, this is the site where in 1605, Samuel de Champlain set up the first fur-trading post on the island of Montreal. In addition, at its crest, you will see a stone sculpture of Albion, representing Great-Brittan. Located on King Edward’s Pier in Old Montreal, is the Montreal Science Center where you will find an IMAX Theatre and many exhibits. Most exhibits are permanent while some are temporary for a year or two. Currently, an exhibit presents Aboriginal technologies from before the French and British colonization of Canada that we still use to this day. Rates vary from $8.50 for children to $15 for adults. Moreover, there are separate rates for the IMAX theatre. It is open from 9 am to 4 pm most days. This museum, located within the Notre-Dame-de-Bon-Secours Chapel, presents exhibits dedicated to a 17th-century local pioneer, Marguerite Bourgeoys. Of course, you will find it located within the 300-year-old chapel. Located on Notre-Dame, at the intersection of Saint-Claude, across from Montreal’s City Hall, is Château Ramezay. Indeed, governor of Montreal, Claude de Ramezay, built this historic site 1705 as his residence. 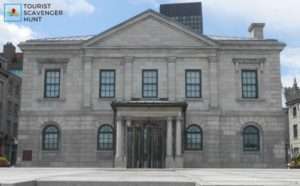 Today, it houses a museum on the history of Montreal. It is open most days from 10 am to 4:30 pm. Fees vary from $5.75 for children to $11 for adults. You can visit the five-story Montreal City Hall. It was erected between 1872 and 1878 in the Second Empire style. 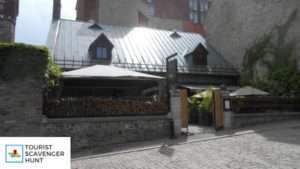 You will find it located on Rue Notre-Dame, between the Champs de Mars and Place Jacques-Cartier. A fire gutted it in 1922. Consequently, the city rebuilt it with a Beaux-Arts styled copper roof. In fact, in 1967, the French President and former General, Charles de Gaulle gave a patriotic speech which enflamed Quebec’s separatist movement for many decades. It is open to the public between 8:30 am and 5 pm daily except Sundays. You will find The Centre d’histoire de Montréal, or Montreal’s Historical Center, located in an old Firehouse dating from 1903. It is built in a Flemish style. Here, exhibits on three floors present famous events from Montreal’s past, as well as pictures and portraits of everyday life here in different time periods. The city’s oldest bank building, built in 1847 in Pantheon style, presents not only historical exhibits but also an actual teller’s station and mechanical banks. You will find it located at Place d’Armes across from Notre-Dame Basilica of Montreal. It is open weekdays from 10 am to 4 pm. 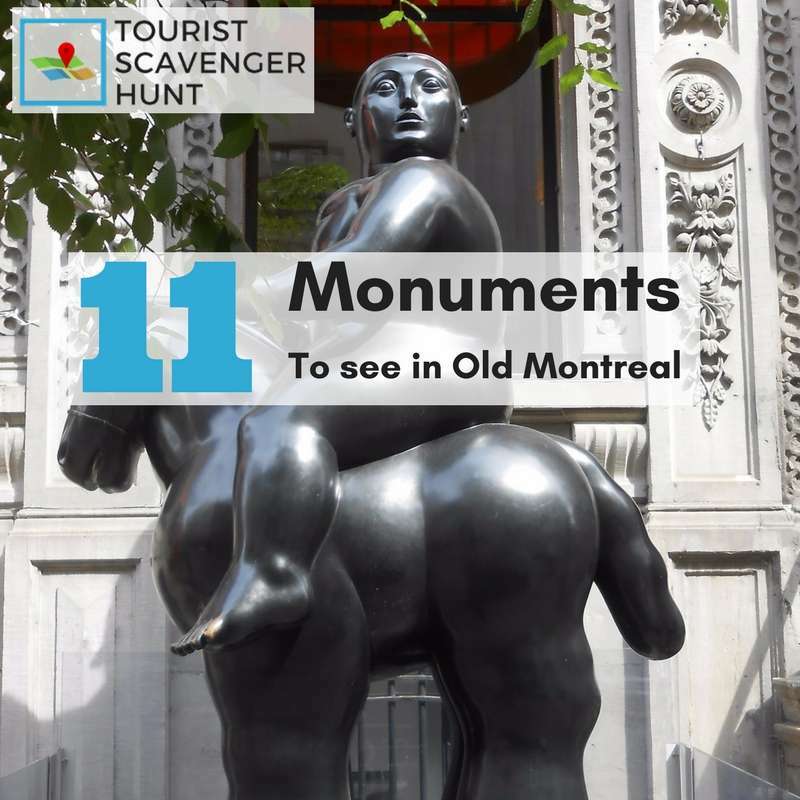 We invite you to try our Old Montreal Tourist Scavenger Hunt. It is a 2 and a half hour guided walking tour around Old Montreal you do on your mobile phone (how it works). It only costs $30 for your group and you will enjoy seeing these museums and much more while completing challenges and learning Montreal’s history. If you are a world traveler, chances are you’ve noticed, or have visited a Hard Rock Cafe or more. In our case, it is much MORE. In fact, we’ve visited together almost 100 Hard Rock Cafe locations around the world – across North America, Europe and Asia. We live in Montreal, in Quebec, Canada, the French-language hold out of North America. Our local Hard Rock Cafe closed on September 25th, 2011. We’ve since met and reconnected with the manager at the time. He still works for the chain. He is currently in south-east Asia. The HRC Montreal was established in a century-old building on Crescent Street in the heart of downtown Montreal. Crescent is lined with great restaurants and terraces and a popular destination during the Montreal Formula One Grand Prix weekend. It opened here on September 20th, 1990 and showcased a huge and very high skylight, typical of older Hard Rock Cafes around the world from this time period. Every HRC boasts a wide variety of musical paraphernalia and often concentrates a little more on one or two artists. These are usually local artists or some who’ve had a more significant impact here. Montreal’s HRC was dedicated to the Beatles with a bright glasswork of Sgt.Pepper’s Lonely Hearts Club Band and facial sculptures of the fab four in the outer entrance. It also paid special attention to KISS and Guns & Roses. Why the Beatles in Montreal? Because this is where John Lennon and Yoko Ono held their second Bed-In at the Fairmont Queen Elizabeth hotel (few blocks away) in 1969. This is where and when they wrote: “Give Peace a Chance”. There are wax figures of Lenon’s Montreal Bed-in at Musée Grévin Montréal. I’ve been countless times to this location over the years prior to its closing, both on business lunches and with friends and family. Why did the Hard Rock Cafe Montreal close? 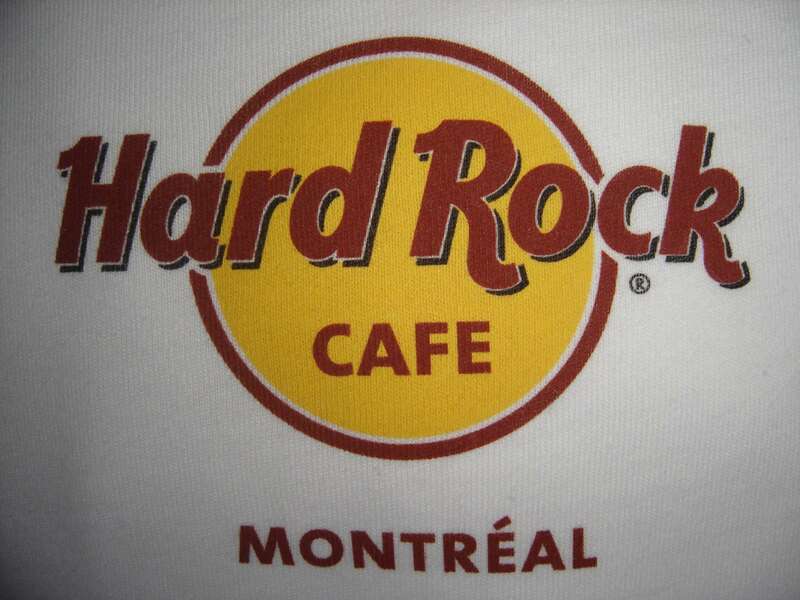 So why did the Hard Rock Cafe in Montreal close in 2011? Originally rumors went around attributing it to the Formula 1 Grand Prix of Montreal not returning for a few years. This actually cost local merchants quite a bit – that weekend accounts for 30-40% of some restaurants’ annual income. However, the real reason it closed is due to required renovations which the landlord wasn’t willing to perform at the time. Moreover, the ever increasing lease forced the franchise owner to make the difficult business decision to close. Today, almost all Hard Rock Cafes in Canada have closed. Ottawa closed on September 1st, 2013 and Toronto closed on May 22nd, 2017. The last 2 holdouts are the Niagara Falls Cafe and Club, also in Ontario, as well as the Vancouver Casino in British Columbia. Are you visiting Montreal? You should try our Old-Montreal Tourist Scavenger Hunt: a 5-km 2h30 walking tour with challenges and riddles – lots of fun! 2 years after the closure the location remained unoccupied and much of the original glasswork, as well as the plasters of John Lennon and Paul McCartney outside the front doors, were still clearly visible. It stood empty for a few more years but has finally found a new tenant – although it isn’t clear whether those required renovations were ever done.